Aubrey Bebee, an ANA Life Member, collected coins, paper money, and numismatic books for most of his life. Bebee began assembling his world-class collection of U.S. paper money in 1941. The collection eventually grew to include many spectacular rarities, including a Series of 1934 $10,000 Federal Reserve note. Bebee sought out only the highest quality notes, many of which he purchased for a moderate premium over face value. In today's market, many of the notes he purchased would sell for far above their purchase price, often by tens of thousands of dollars. 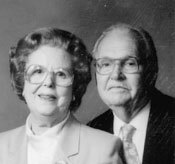 By the time he and his wife, Adeline, donated the collection to the ANA in 1987 it included over 800 individual notes and numerous uncut sheets. This display showcases some of the highlights from his collection.